In this post we are going to provide you the jumper solution for Nokia 3110c MMC problem. This IC deals with all memory card function. So if you are getting errors like Memory Card not formatted, Memory not ready, Unable to open Memory card, msdc error in Nokia 3110c, you can use this solution. First try to make jumper as shown by the long green line. If it don’t work, remove two ICs shown by red arrow and make jumpers as instructed. 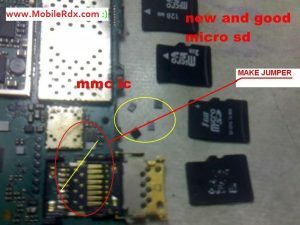 This will solve all your Nokia 3110c problem with Memory Card IC like Memory Card not formatted, Memory not ready, Unable to open Memory card, msdc error or memory card not showing.